And another Saturday Light Brigade is “in the can”! Congratulations to our fine students on wonderful performances and interviews! Thank you Mr Erich for expanding your students’ experiences in performing! Kudos to the students for handling the interviews with poise and confidence! Watch for the next SLB program, coming up soon with Ms Simmi and her piano students! Friday Night Club – Watch for a new name and new day! 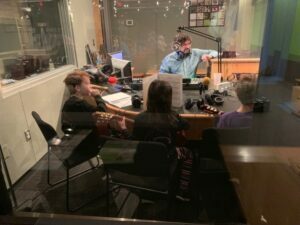 CYM Guitar Students Wow Pittsburgh Radio Station! Gear up for the Solo Recitals! Where to Start Music? In the Home! Spring is Here, and Summer Camps are Soon! CYM Welcomes New Sewickley Neighbor – Studio419! Confidence Workshop a Big Success! Ms Grace’s Community Concert Fills the Day with Beauty! Never miss a concert, recital, or show. Sign up for our newsletter! 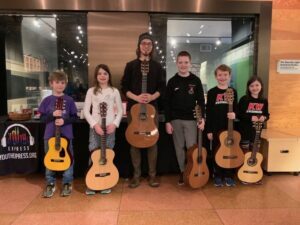 © Copyright 2019 Center for Young Musicians. All Rights Reserved.